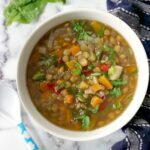 Slow Cooker Lentil Soup with vegetables, a delicious meat-free soup that goes down a treat on a cold day. Suitable for a vegetarian or vegan diet, but filling enough that even meat lovers will appreciate it. Gluten free, low carb, low calorie, high vegetable protein. Peel and chop the onion, garlic, carrots and parsnip, and add them to the slow cooker together with the frozen chopped mixed peppers and lentils. Add the vegetable stock, and leave to cook on low for 5 hours, or 3 hours on high. If you like your soup thinner, add one more cup of vegetable stock. Once the lentils and veggies are cooked, add the spinach, tomato paste, thyme and parsley, and season to taste with salt and pepper. Cook on high for 10-15 minutes so that the spinach can wilt.